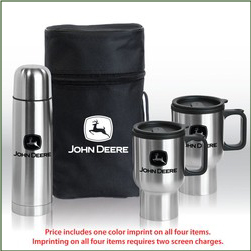 Contact Colorado Promotion to order these Custom Stainless Steel Coffee Set with imprinted items including a vacuum seal bottle thermos with push and pour mechanism, stainless steel mugs with thumbrest and spill proof lids, and a handy travel case (also imprinted). These sets make great gifts or giveaways or prizes. Perfect for school fundraising, booster clubs, and outdoor use.